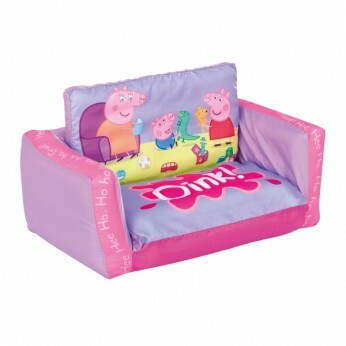 Fans of Peppa and George will love this fun and practical inflatable flip out sofa. This comfortable sofa, which unfolds into a fun lounger, is perfect for any bedroom and great too for relaxing in the lounge in front of the TV! Its inflatable inner is easy to inflate, and when deflated, makes it easy to store away. The soft cosy cover is removable and is machine washable so spills aren’t a problem and it can be kept fresh and clean…. Peppa and George fans will adore this 2-in-1 inflatable sofa, both comfortable and fun, which folds down into an enjoyable lounger! Pretty in pink and purples this stylish sofa with a soft cosy exterior and easy to store functionality is perfect for your little one to relax on after a hard day at school. Unfolds into a fun lounger; Removable machine washable cover; Easy to inflate; Gift boxed; Size H26, W68, D105cm; 0.9 grams; For ages 18 months and over; EAN/MPN/UPC/ISBN: 5013138637487. This toy costs approximately £19.99 (for the latest and best prices make sure you check our retailer list for the Peppa Pig Flip Out Sofa above). In our review of Peppa Pig Flip Out Sofa we classed it as being suitable for ages 3 years, 4 years, 5 years but recommend you check the manufacturer specific advice before purchasing.